We all love to be indulged once in awhile, but how much more fantastic does it feel to know that you’ve just made someone’s day? Not just anyone’s, but your bestie’s? Of course they should be worshipped and adored all of the time just for sticking around, but sometimes a little gift conveys more than you can put into words. 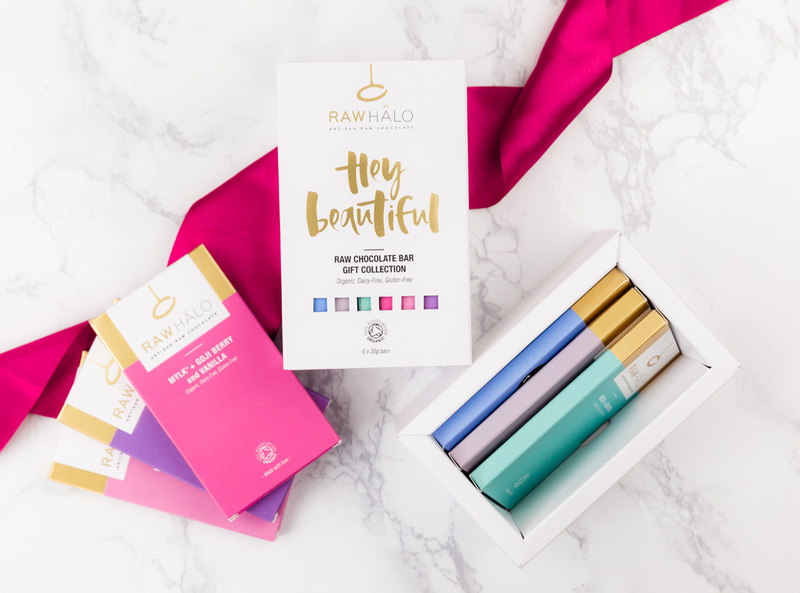 We’re all about the gift giving here at Raw Halo HQ and so we’ve compiled our top 10 gifts for your bestie under £20. 1. Metallic Martini Glasses (£18). 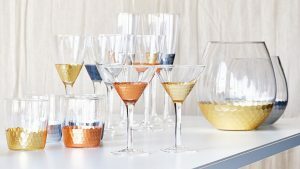 Every special occasion should be celebrated with a delicious cocktail, drunk from these gorgeous martini glasses. The hand-finished delicate copper and gold foiling will make any contents look elegant and worthy of a toast to your favourite person. 3. 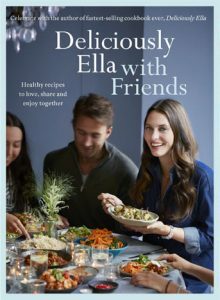 Deliciously Ella with Friends Cookbook (£12). Ella’s latest cookbook focuses on cooking for friends – making it the ideal gift to give to a friend. (Hopefully you’ll get to sample some of the delicious recipes too). 4. 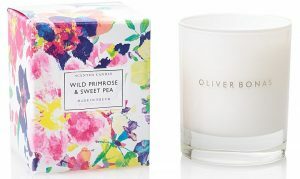 Wild Primrose and Sweet Pea Scented Candle (£20). Celebrate your bestie’s uniqueness with this limited edition, handmade candle. Not only does it look beautiful, but it smells divine too – evocative of an English Country Garden. 5. Friendship Knot Bracelets (£16). 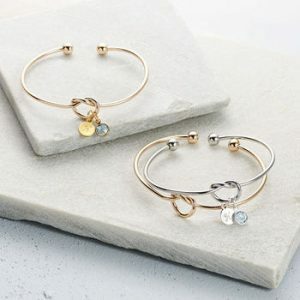 These silver or gold plated handmade friendship bracelets are the perfect gift for any occasion, even better when there is no occasion, just “I Love You’. 6. 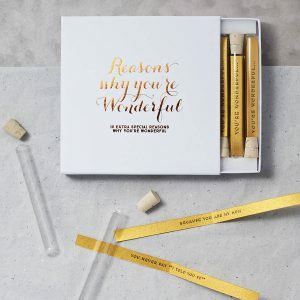 “Reasons Why You’re Wonderful” Message Box (£19.95). Sometimes we all need a reminder of why we are wonderful and this little gift box, with its simple statements, tells your bestie how much you treasure their friendship. 7. Pewter Heart Trinket Box (£20). 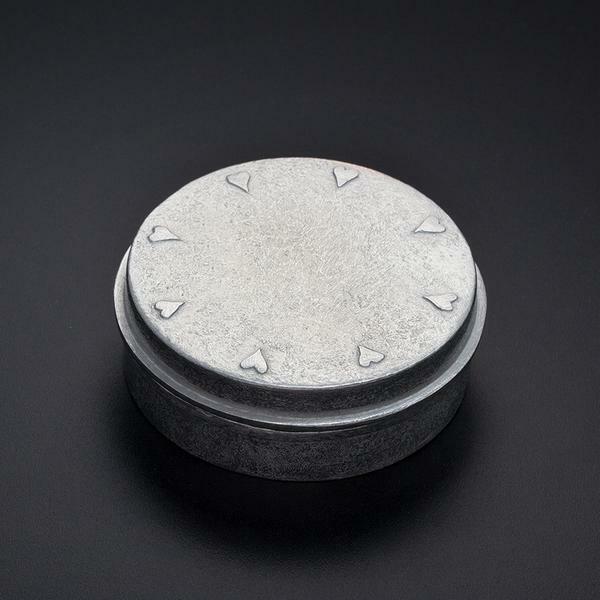 This hand cast pewter box will look beautiful on any dressing table, a perfect home for any special keepsakes that the two of your share, or as a place for things to come. 8. Skinny Prosecco (£18). 100% organic and certified vegan. This low sugar prosecco is crafted from grapes grown in the foothills of the south-facing Italian Dolomite mountains. Thomson and Scott skinny champagne and prosecco is the brainchild of the gorgeous Amanda Thomson, who was raised on a sugar-free, vegetarian diet. 9. “Adventures Are Forever” Print (£15). They say that a picture paints a thousand words, but this one, with its three simple words, effortlessly captures your fun times together. 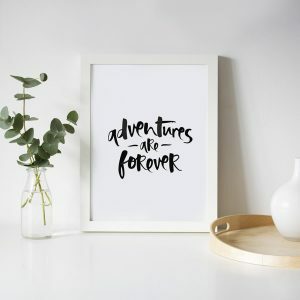 Designed with free spirits in mind, this print will be a welcome addition to your bestie’s room. 10. 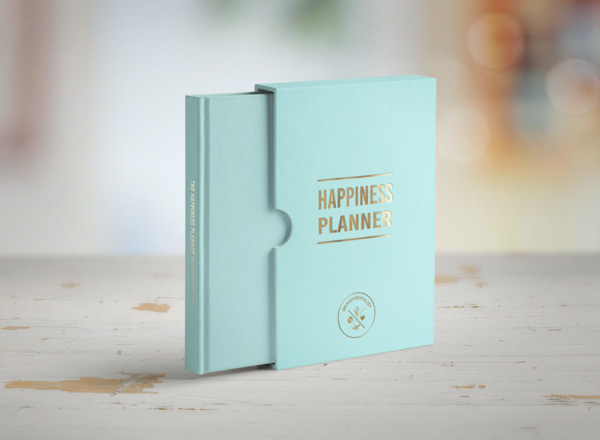 100 Day Happiness Planner (£20). Bringing your bestie 100 days of happiness. 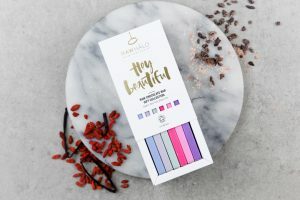 This beautiful planner, available in a variety of pastille hues, is designed to help you focus on happiness and positivity through a series of self-reflection practices; think mindfulness, gratitude, and positive thinking techniques. Treat them to a pack of Inspirational Crayons to add a splash of colour to their planner.